I was a poor eater as a child. The very word squash was so unappealing to me I would never have considered even trying it. But in my 20’s my great uncle Nat sent my mother a huge Hubbard squash from his farm in the Berkshires and she turned into a soup. My father was coming downtown to bring me something and she asked if I would like some of the soup. “No thanks” was my response and luckily she ignored it. When I hesitatingly tasted the soup I was astonished by the deep earthy sweetness and velvety texture of the soup. A few weeks ago, when I told my neighbor Jason Menegus that Hubbard was my favorite squash, he promised to save me one from the Fall harvest. And when I went to pick it up I could hardly do so. 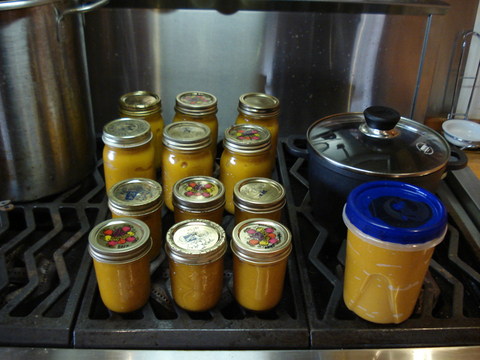 My husband, who has been transporting it around from farm to car to kitchen assured me it was under 50 pounds but all I can say is that every time I lifted the pot of soup I made from it in and out of the oven to stir I groaned. It was worth it. I now have something like 24 dinner servings of it in my two freezers. And it is even more delicious than I remembered. Here’s the basic method which certainly can be adapted to smaller squash with greater ease if less drama. 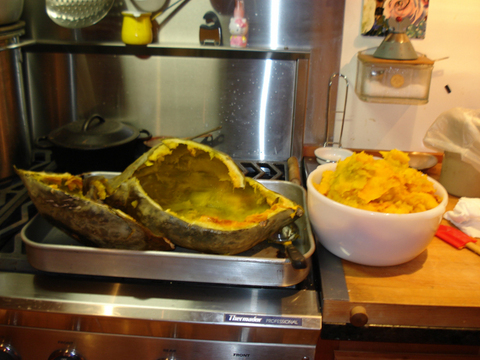 I began by cutting the squash open using a cleaver and rubber coated mallet. This was harder than it sounds as the squash was so huge the blade of the mallet immediately buried itself inside of it and was impossible to extricate. Determined to remove it I used the mallet to strike the underside of the handle, averting my head so that it wouldn’t fly up and knock me unconscious. 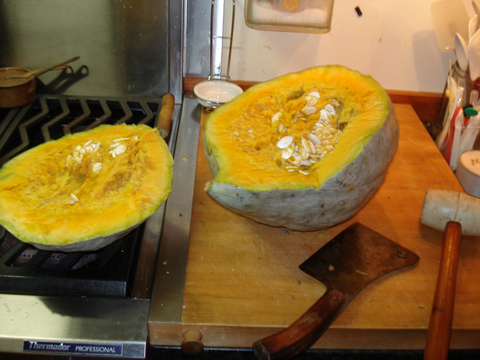 Then I struck it into another section of the squash. Finally it split open—not evenly—but to a manageable size to fit into my largest roasting pan. I scooped out the seeds, placed both pieces in the pan along with 2 cups of hot water, covered it with foil and set it in the oven preheated to 350˚F. My intention was to roast it for about 2 hours but I started watching the DVD I made to go along with the new book and was spellbound for 3 hours until suddenly I smelled the squash. Luckily it was just perfectly cooked—tender enough to scoop the pulp into a large bowl. It yielded 3533 grams/7.7 pounds of pulp. I placed the pulp in my largest enameled cast iron Dutch oven and added 2 pounds of potatoes, pared and cut into large cubes, 2 heads of garlic separated into cloves, lightly smashed to remove the skin, a few branches of fresh thyme, about 1 tablespoon of coarse salt, about 2 cups of water, and 4 large cubes of glace de poulet (a quart of unsalted chicken stock would be fine) and put it back in the oven until the potatoes were cooked –1 hour. I groaned every time I pulled it out of the oven to test it--it might even have come out as an "oy". (Now I know why many tennis players make such aweful sounds following every stroke--I think it helps the effort in some way!) i think i'll leave that typo (aweful) it's not a bad distortion of the word! It was about 11:00 pm by then so I decided to set the pot outside where it was around 45 ˚F overnight to cool. The next morning I removed the thyme branches that had shed their leaves and puréed the mixture in several batches in the food processor until all the fibers of the squash were pulverized and the mixture was velvety smooth. I like cooking thick soups like this in the oven as on the cooktop it risks burning on the bottom unless stirred constantly. I wanted to make a very concentrated thick soup for storage in the freezer as it takes up less space and after defrosting can be thinned with milk to the desired consistency. One cup of my mixture weighed 245 grams/8.6 ounces to which I added 2/3 cup of milk (you can use part water), 1/4 teaspoon salt (best to do this to taste), a grinding of black pepper and after ladling it into a bowl, swirled in a heaping teaspoon of crème fraîche and sprinkled it with Aleppo pepper. 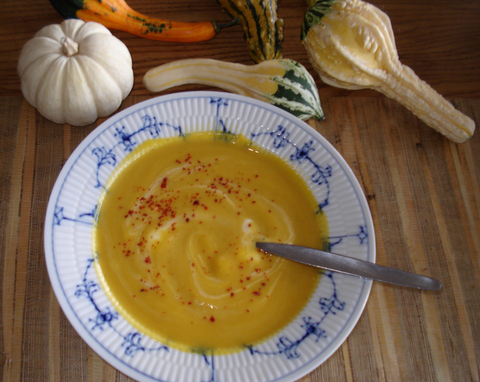 The red was a pretty contrast against the pale gold of the soup and also added a gentle spike of heat. I’m posting this right away in the chance that you will still be able to find Hubbard squash but if not, be sure and make a note to try it next year. It could become an annual Fall tradition (Or bi-annual as we’ll probably still be enjoying this huge amount into the following year)! * The beautiful gourd table decorations were also compliments of Jason.